I hope you guys are well. Since Halloween is just around the corner here’s a quick DIY costume accessories idea for Wonder Woman. 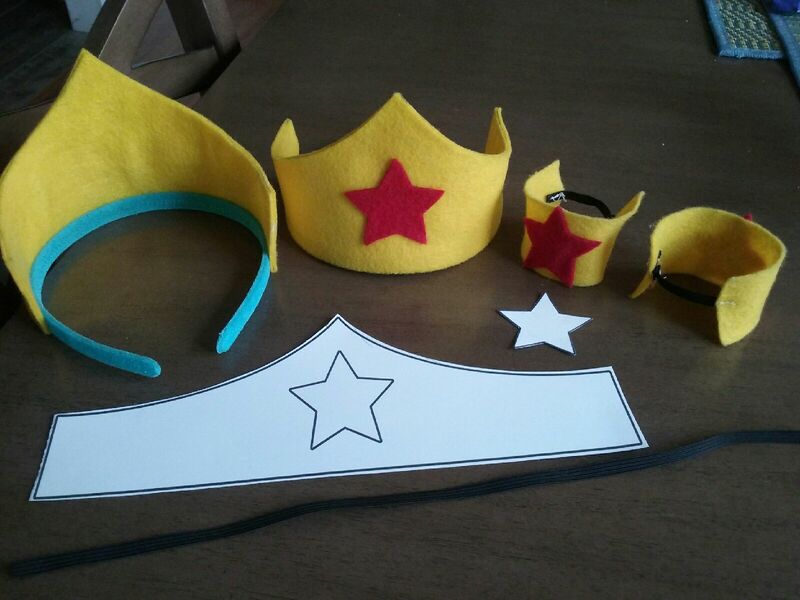 I made these headpieces and wrist cuffs for my daughters who wanted something simple to wear on Superhero day at their school. They wore a plain blue shirt and jeans so the accessories would pop out more. They didn’t want to do the typical cape and mask thing so I found a good template online for Wonder Woman’s headband and got to work. Using the template to get the design, I folded the felt in half to make it sturdier with two layers of felt as oppose to just a single layer. I glued the headpiece at the edges with some tacky glue and then made the stars with a template and red felt. I then glued the headpiece onto the plain headband. The tacky glue doesn’t dry instantly so I used large paperclips to secure the felt onto the headband until it dried. It worked like a charm. For the wrist cuffs I simply cut out a long rectangular piece from the yellow felt and split it in half. I then glued the stars in the middle and sewed on a small piece of elastic so they could slide it onto their wrist and have fun pretending to be Wonder Woman, which they did. I hope you like this idea! More Juvenile Chapter books for you to check out!